Like all foodstuffs, flour should be stored in a certain way to keep it at its best. Below, you’ll find some helpful tips for storing flour. You can also read what can happen if you don’t store it correctly. Plus some hints and tips for preventing and getting rid of insects. 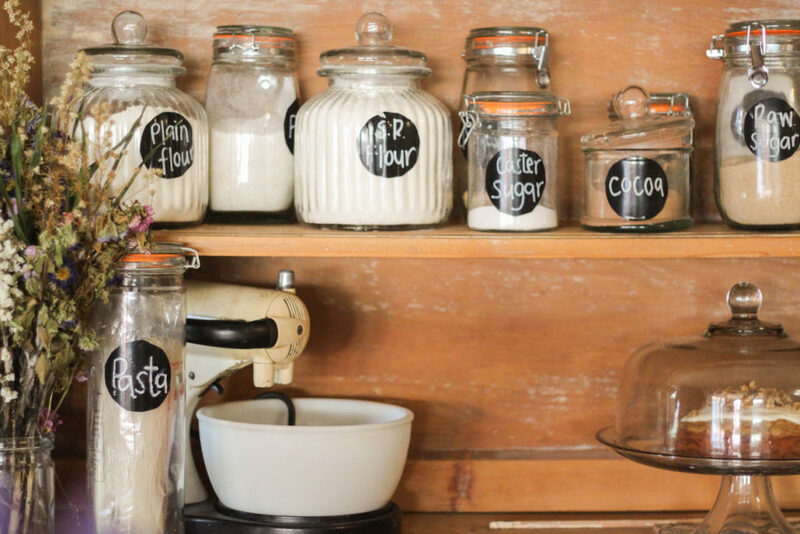 Flour can be stored in its original packaging or in an air tight container on a shelf or in a cupboard in a cool part of your kitchen. Never mix old flour with new flour. Wholemeal flour keeps less well than white flour as the oils from the germ and bran can become rancid with age. Wholemeal flour will normally keep for about three months while white flour will be OK to use for six to nine months. What can happen if flour is not stored correctly? If moisture is allowed to get into the flour, it may cause it to become clumpy. In some cases, flour can attract psocids (see below). It is often wrongly assumed that the flour is the source of the infestation. This isn’t the case. Flour provides food and the perfect living habit for them. Psocids (or flour weevils) are tiny brown or black insects which live in dry foods. They are NOT caused by poor hygiene – psocids can be found in the cleanest of cupboards and cleanest of kitchens. They prefer to live in dark, warm, humid places – such as the folds of packaging in food cupboards. They dislike light or disturbance. Psocids feed on a wide variety of food products – such as flour – and also the microscopic moulds that develop in humid conditions. They may live for about 6 months during which time the female may lay up to 100 eggs. Several independent studies have shown that the psocid species which causes the majority of problems in homes originates in the tropics and is not found in farms or mills where flour is produced. They can be particularly attracted to fresh flour, so much so that if a new bag of flour is placed in the cupboard they will travel from an older bag to it. Therefore people wrongly assume that they psocids came in the flour. How can I prevent psocids? Packets of food that have been opened should be used up quickly and not pushed out of sight to the back of the cupboard. Only store food in cool, well ventilated places. Many fitted kitchen cupboards are made from laminated chipboard and the surfaces, which are not on view, tend not to have a laminated finish. These unfinished edges can provide crevices for the psocids to hide in and should be sealed with a coat of paint or varnish. Regularly clear out and vacuum your cupboards, disposing of the bag in an outside bin immediately. Never use a damp cloth as this may seal dry food into crevices. More information can be found in our Psocids Booklet; or from the Chartered Institute of Environmental Health website.